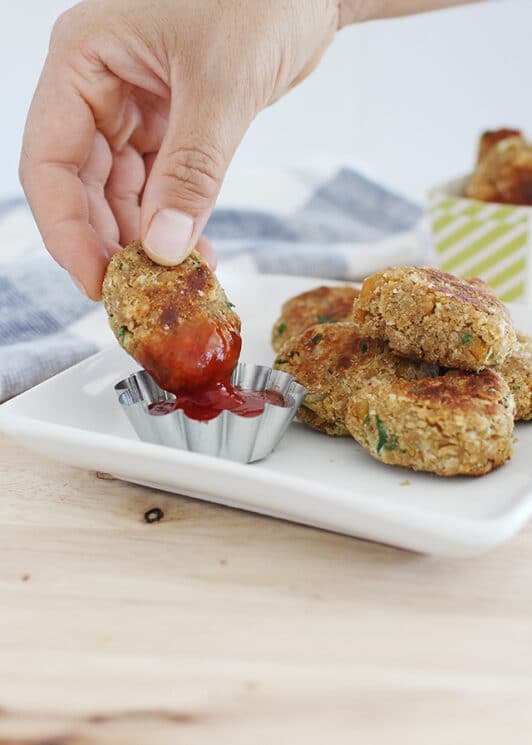 Expert tip for getting your kids to eat beans: Turn beans into something familiar, like chicken nuggets. Did you happen to see the Jamie Oliver episode where he put a nasty chicken carcass into a blender and shaped it into chicken nuggets? The kids, knowing what was in it, still ate it! They ate it because it looked like chicken nuggets! Our falafel had the same idea, except with CHICK-peas, instead of a chicken carcass. Get it?? My kids didn’t know what was in it, but they loved these! I started with a basic falafel recipe, and made a few modifications. 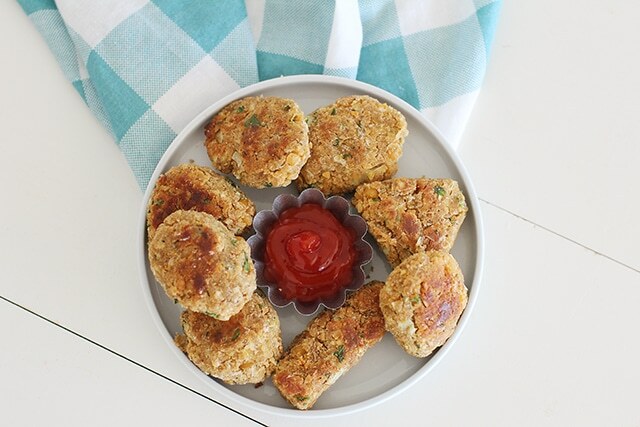 Falafel is basically mashed up chickpeas (also known as garbanzo beans), formed into patties and deep fried or baked. While it’s typically eaten out of a pita or bread, it’s also delicious alone or with a dip. Chickpeas are a fabulous food to include in your family’s diet. Chickpeas (AKA garbanzo beans) are a great source of maganese. Chickpeas and other beans are rich in fiber- essential for digestion. Chickpeas contain folate, essential for young kids and pregnant mothers. Chickpeas are a natural source of iron. You can shape these into chicken nuggets shapes and either bake or fry. I “grilled” in a cast iron pan with a small amount of olive oil. Then I made that Origami Fry bag. WE LOVED THESE!! Just so you know! Drain and rinse chickpeas; mash with a pastry blender or fork. Slice onion. Place the onion, parsley, and garlic into a food processor and pulse until finely chopped and well blended. In a small mixing bowl, whisk together the egg, cumin, salt, pepper, lemon juice, baking powder, and 1 tablespoon oil. Add onion mixture and egg mixture to the beans; stir to combine. Stir in bread crumbs little by little until dough is dry enough to shape easily; shape into nuggets. Heat remaining oil in a large skillet. Cook nuggets until heated through and golden brown on both sides, adding more oil as needed. While nuggets cook, heat edamame according to package instructions, and slice apples. This is kind of like falafel. I looooooove falafel! Mine has a lot more cilantro and parsley in it, and the kids don’t particularly like it. I’m going to try making it your way for the kiddos! If my kids eat these, I will kiss you. I will absolutely be trying this ASAP! Okay, I can’t wait to get home from our vacation to try all these. Those look so yummy! my kids will love these! chickpeas are their favorite! can’t wait to try this recipe. My kids are in nugget withdrawal now that we are eating better. It’s the perfect time to try these! This is such a great idea! Definitely giving them a try. Another great Amy creation! I haven’t been a big fan of falafel because it’s always deep fried greasy. I will love to try this version. Thanks! This is great! I did see that episode of Food Revolution when he put the carcass in the food processor and the kids preferred that over an actual piece of chicken. This is so clever! Great idea. I do the same thing with slightly cooked cauliflower. Sometimes I add little bit of cheese into the mix. I’m new here and I think I love you. I’ll be stopping by often to try out your recipes on my kids. Thanks!! Oh my goodness those look great. Can’t wait to try them out!! This sounds great! I’m going to switch it up with some gluten-free breadcrumbs and feed it to my vegetarian/celiac sister. It sounds better than the frozen stuff we buy! Great Idea Lisa. I also saw a recipe that used mashed potatoes instead of bread crumbs. Cauliflower would be a yummy! I remember that about you Cathy! That is why I posted it, because i knew even bean haters, sometimes like falafel. Love this idea…I’m gonna have to see if I can get them past Alex and Soph! I made these for supper tonight. My kids LOVED them…I managed to save a few for their dad when he gets home from work. (I didn’t tell the kids what it was made from though – I have one sworn bean hater when she knows what is in it. She was my most vocal lover of these.) I didn’t have bread crumbs so I used blended oatmeal instead and they still worked great. I’m so glad Shauna! I always get anxious about putting ideas out there and having every other child in American hate it! So thanks for easing my mind! I made these last night & they were DELICIOUS! Do you think I could make a big batch & freeze them, and reheat them in the microwave as needed? I have never tried it! But I think they would be just fine!?!? I made this and it was AWESOME! It’s only me and my boyfriend in my apartment, so it also gave us leftovers. I think the next time I make it, I will add chopped broccoli to it. We were also thinking this would be a great appetizer to bring to a party. I’m trying to think of a good dip for it. I ate mine with spicy mustard the other day. So good! My kids loved these – ate them all up. They were easy to make too. I scooped up the “dough” with a cooking scoop and then flattened them out a little. They reminded me of small patties and so I may make little veggie burgers next time by putting them on a small bun. We dipped the nuggets in the Panda Express Spicy Orange Sauce you can buy at COSTCO. Delicious. Thanks Mary, I’ve been trying to think of something to dip!! I am beyond thrilled to find this! Thank you for sharing it! I can’t wait to try it! This looks really interesting! If you were going to bake them, what temperature would you use and for how long? I haven’t tried that Veronica.. But I would start with 400 degrees, for about 15 minutes. you’re killin’ me with these amazing recipes! 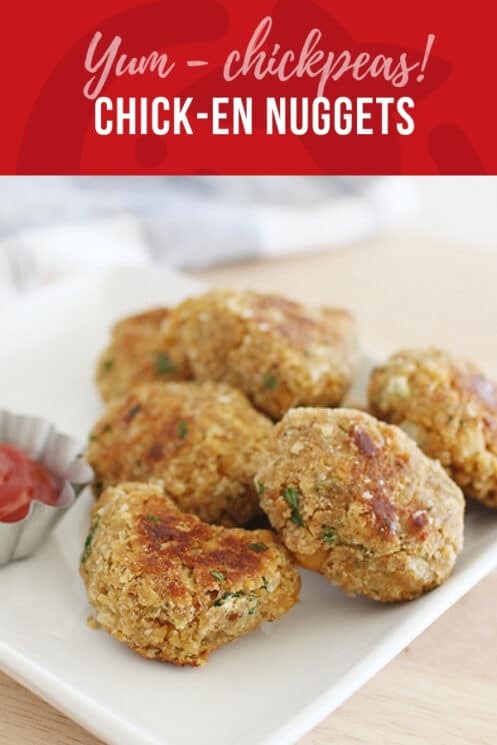 I am about to bake CHICK-EN NUGGET FALAFEL and have no idea how long to bake them for. Thanks for all the great recipes, I love your site. We still haven’t tried baking them. We just cooked them on a hot griddle with a little cooking spray or coconut oil/ or olive oil. If you were to bake them, I would try 400 degrees, and 15 minutes or so, and keep checking them till they get brown. Good luck! Thanks for reading my blog. we tried these both ways – pan grilled and in the oven. I put them in at 400 for at least 15 mins and they weren’t done – they were still soft and not at all brown. Obviously they needed more time, but I’m not sure how crispy brown they would’ve gotten anyway. I think I’ll still to the pan grilling method. Hi! Thankfully we only don’t do fast food – chicken carcass is pretty gross! I’ve got these baking in the oven right now. Question: first I lightly browned them in oil and then put them in the oven. I just tested them and while I really like the flavor they are really soft, more like a pancake. Are they supposed to be that way or should they be crispy? I just discovered your site and can’t wait to see all your recipes! It’s been awhile since we’ve made these, but I’m pretty sure the outside was crispy, and the inside was soft. Maybe a little longer on the skillet browning time? Even soft, I bet you’ll like them. My kids ages 10, 10 and 13 devour these! I serve them on a bed of lettuce with chopped cucumber, tomatoes and a basic homemade cucumber dip (olive oil, vinegar, garlic, greek yogurt, shredded cucumber and dill) and everyone in the family loves ’em! Delicious!! Made them today and my girls devoured them. I have never given them chicken nuggets before, so I wasn’t sure how they would like them, but the whole pile was gone! I substituted the egg for flax and still turned out. Thanks for the awesome recipe, we’ll definitely be making it oftne. I have two very picky boys. Will they be fooled if I make these? Or at least will they taste enough like frozen chicken nuggets that they won’t care? LOL! You don’t have the egg & bread them after shaping? I made these last night for dinner. They were sooooooo awesome! My kids have colds, so they weren’t too keen on eating something new. However, my husband and I ate almost all if them. I used a 25 oz can of organic chickpeas. I almost doubled the recipe. Also, made a dipping sauce with Greek yogurt and fresh garlic in my mini chopper. Will definitely make again soon!! Thanks for the great, healthy recipe! Love it! Thanks for sharing Greta! How many “nuggets” does this recipe make? Trista- I’m not sure! I’ll measure next time we make them! I just rolled out a triple batch of these for my family tonight (family of 7). With my 1.5 TBSP scoop, I got 33.5 oval nuggets the size you’d find at the local fast food chains. A normal recipe would yield about 11 nuggets. FYI! I’m baking some and frying the rest – I’ll be back to let you know what my “No Bean-ers” think! Trista! You are awesome! thanks for counting! Can’t wait to hear what they thought!! I made these tonight. 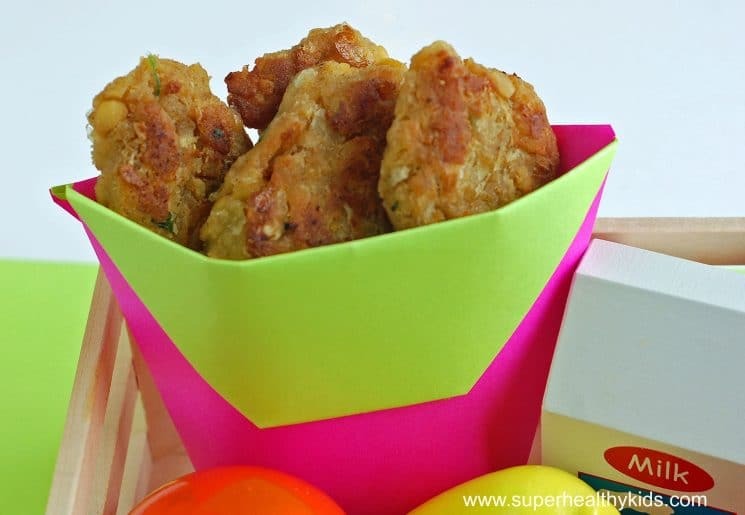 While I liked the flavour; and my kids did them, the nuggets were crumbly. My husband is usually the cook around here, so I’m not sure what I did wrong. Do you think I added too many bread crumbs and that’s why they ended up crumbly? When you pan fry them; do you basically shallow fry them? Maybe your egg wasn’t large enough? Cutting back on the bread crumbs might be a good start. And yes, just a small amount of oil in a shallow pan. these might take a few times of making them to get them just right, so keep trying! 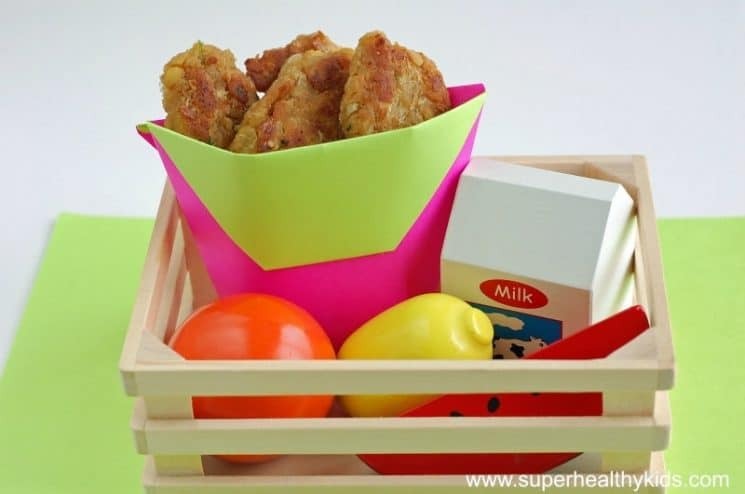 This is a wonderful recipe for nuggets that I think the kids will love. I just made these now and they tasted great! Thanks for sharing! Great recipe! Made these for my little nugget connisuer and she loved them. I made enough for lunch and after we ate I came back to cook the rest. I noticed after the “dough” sat for a while the nuggets were crumbly. I had to work in some oil to get them to hold together again. Maybe this could have been the previous poster’s issue as well? Cant wait to try these on my bean haters – though i can say theyre happily turning, ever so slightly, into bean tolorators. Do you think a white bean like great northern beans would work as well? Those look good! I love all beans, especially chick peas. I’m going t make these tonight! Thanks for sharing the recipe. About to pin it! What temp would you bake at and for how long? Can It be pre made and frozen?? Would these be good cold in a lunch kit or are they only good warm? Hi. How can I replace eggs? @kristen- yes, we freeze them, and reheat in the oven so they stay crispy. @tasha- I like them cold just fine! Have eaten them plenty of times this way. But they are delicious warm as well. @naaz- I haven’t tried it, but other binders like a frothy flax and water mix could work! These are really good! To make them gluten free so my husband can eat them, I used almond meal, instant mashed potatoes and ground flaxseed. Thanks for the recipe! You could just try to leave it out Eleonor. would love to try these..my daughter is 9 and knows the difference in taste..could anyone else’s children (older) tell the difference? I would love to make this but my daughter is allergic to chic peas. Any suggestions of what to use in place of? That’s horrible @marnie! I’m so sorry- I haven’t tried this with other beans unfortunately. How would I store these if I wanted to make a big batch for my three year old? Cook them and then store in the freezer? and then do I just reheat in the microwave? Yes, Katie- or you could bake them if you like them a little crispier. I lived in Kurdistan where I fell in love with Falafel, and this is a perfect recipe to replicate my favorite kinds. Thank you thank you thank you. My kids love them, and they thank you too. I just found this website and I am super excited. What would you do for diy bread crumbs? i am going to try these today with my picky one. i wonder if these would work with kidney beans or lentils? has anyone tried that? Meredith- we toast whole wheat bread and then grate it with a cheese grater to get the crumbs. How many cups of beans do you get out of a can? I am substituting stove-cooked beans for canned. Just FYI, Kidney beans were not so delicious with this recipe. I am going to try the recipe as given. Great recipe!! very short for novices. May juszt you please lengthen them a little from subsequent time? How long do you bake them for? What temp? Looks good! Can i omit egg? MY son is allergic to eggs..
@Jennifer- 1 can has about 1 1/2 cup beans. 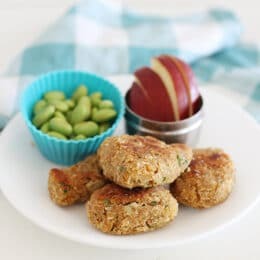 I want to try these – I wonder if the texture would be ruined if I used Garbanzo bean flour instead of the mashed bean? @Alicia- I actually think it wouldn’t work with flour. The texture from the whole beans helps it to work! @Stacey- how did it go?? These look exciting for afternoon snacks! My kids quite like beans but my husband moans if they make their way into a meal. So if I can serve them up at non-mealtimes everyone will be happy! Just one question, dry breadcrumbs or fresh? I was too impatient to wait for an answer, though, so I took the middle ground and toasted a couple of slices of bread and food processored them. They came out fantastic. Ha ha!! Sorry Jen- Glad it worked out! these sound super yummy! i feel like my son is going to turn into a chicken with his love for chicken nuggets! hopefully he will like these and i won’t have to keep buying the processed frozen ones! I am curious to know, how would you bake these? as far as the temperature setting and the amount of time that is. This is not a new recipe. It’s Falafel, a middle eastern staple. Yes- that’s what I said in the beginning 🙂 It’s falafel! these sound delicious. How much parsley did you put in? It’s the only ingredient without a measurement…??? Thanks Rachel- It’s variable, but I’d say 1/4 cup. I’ll go add it! Made these 3 ways tonight for my toddlers: baked, in a skillet with EVOO, and in a skillet with veggie oil. The flavor was great for all, but the preferred option was the EVOO one. For some fun, I also gave the kids 4 different sauces to try dipping them in (my kids love to dip stuff). Honestly, they were pretty tasty, the texture was good, and we will definitely be making them again. If you drizzle some oil on them Jamie, I think they’d be ok. We really like the crispiness of pan frying them. Could I add chicken to these? Instad of Parsley you can use Spearmint ( Nana)..
What size is the can? 15 ounce can of beans. Can you freeze these ? My 2 year old ate these right up. Thanks for an easy, healthy recipe that the whole family enjoys!